Call us at (865)-247-7715 today. Our practice proudly serves the Knoxville area with a tradition of quality service and a friendly staff. Dr. Shane Presson and Dr. Michelle Presson take great pride in offering every patient the most up-to-date resources available in vision care – whether through contact lens or eyeglass fittings, diagnosing eye diseases such as cataracts or glaucoma, treating red eyes or “pink eyes”, or perhaps recommending LASIK or other eye surgery procedures. We will take the time to answer all your questions, explain treatment options, and provide the highest quality eye health treatments available, all in a family friendly atmosphere. Each patient will see the latest in diagnostic equipment, from laser imaging photos to the electronic phoropters in each exam room. We invite you to browse our website to learn more about us and to join our patient family by scheduling an eye exam today. Karns Vision Center is a full service medical eye and vision care provider, accepting both eye emergencies as well as scheduled appointments. Patients throughout the Knoxville and East Tennessee area come to Karns Vision Center because they know they will receive the personal attention and professional care that has always been our foundation. We offer vision financing options and will work with your medical and vision insurance providers to ensure quality eye health and vision care for all our patients. Our one-on-one approach to optometry makes Karns Vision Center the provider of choice in the Knoxville area. Our office provides the following services: complete eye exams, contact lens fittings, glasses, glaucoma treatment, and pre and post-operative care for most eye surgeries. For a complete list of services, visit our services page or call our office at (865) 247-7715. Schedule an appointment today online! Dr. Shane received his undergraduate degree from the University of Tennessee at Knoxville and his Doctor of Optometry from the Southern College of Optometry in Memphis in June of 1995. He is a member of the American Optometric Association and the Tennesee Association of Optometric Physicians. Dr. Michelle received her undergraduate degree from the University of South Florida in Tampa and her Doctor of Optometry from the Southern College of Optometry in Memphis in June of 1996. She is a member of the American Optometric Association and the Tennesee Association of Optometric Physicians. Michelle has been with Karns Vision Center since the doors were opened in 2008. She is instrumental in all aspects of our office and patient care. She has over 15 years of experience in medical/vision billing and coding. Michelle strives to ensure things run smoothly for our patients. Kirsten strives to make each patient feel welcome by greeting them as they walk through the door. Along with assisting patient with questions & scheduling appointments, Kirsten can be found in our optical department or repairing glasses. Kaitlyn is our lead ophthalmic technician who assists our doctors by conducting visual field tests, as well as other medical tests or photos needed by the doctor; pre-tests patients, and assists patients with eyewear sales. Kelsey is effective in all parts of our office. You may find her in the exam rooms working as a technician or up front checking in patients, teaching insertion & removal or assisting in the optical. Zoe is one of our front desk assistants. She is in charge of verifying insurance benefits & strives to make sure patients have the best experience they can at our practice. Zoe updates our Facebook page & creates our monthly newsletters. We are so excited to introduce the newest member of our team! Sarah assists patients in finding frames that fit their style and budget. "Dr. Presson is very thorough ans patient and takes the time to get to know me personally. I'm very satisfied with the services. I absolutely recommend them." "Karns Vision Center always provides Excellent Service and provides the most comprehensive vision check up you can get. They use the best equipment available and check all aspects of your vision. The staff is extremely knowledgeable and polite and Dr Michelle and Dr Shane are both fantastic. They will take as much time as you need to answer any questions you may have. They are by far the best Eye Care Center I've ever been to. Use Karns Vision with total confidence that they will provide you with top quality eye care." "The staff was very courteous and prompt. The optometrist was knowledgable, very professional, and thoroughly explained my vision changes as well as treatment options. This was maybe the best eye exam and total treatment experience in the 35 years." "I arrived at 8 for my 930 appointment. They worked me in and I was on my way by 9. My glasses were broken and they fixed and cleaned before the exam was over. Thank you very much!" "Always best experience and care available. My entire family are have been patients for many years and have never left disappointed. The Best of the Best!" "Dr Michele and her staff goes out of the way to make your visit perfect. They treat you very well and are very professional and know what the best plan of action is for you. Highly recommended. 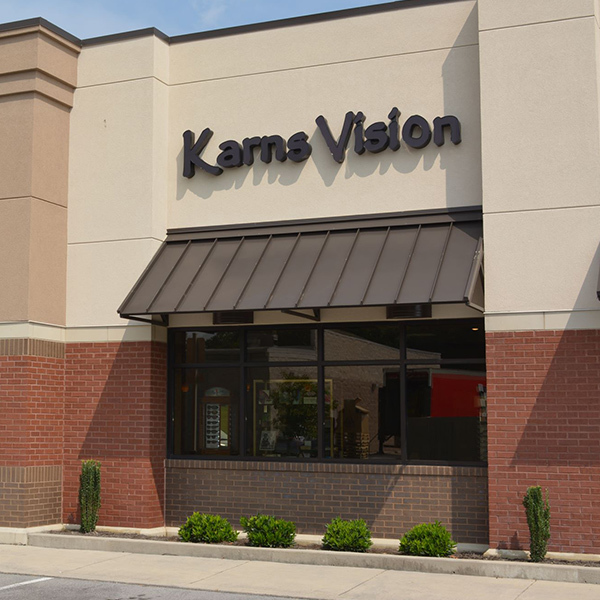 They take good care of you"
"I so enjoyed my eye exam at the Karns Vision Center. The entire staff were friendly and professional and truly were excited about doing their jobs! It showed in their attitudes and especially in their smiles and the way they conducted themselves as a business. I have never had such a complete and thorough eye examination. Highly recommend if you are in need of eye care." "I appreciate Dr. Shane seeing Ralph so soon. He was the reason we went to the hospital. He did an excellent job in diagnosing Ralph as having had a stroke. If it wasn't for him there's no telling how long we would have waited to take Ralph to the ER. I want to thank Dr. Shane for taking the time to call me and check on Ralph. He's a pretty good fella. Thanks again"